⚙ Did you know WD-40? Did you know that WD-40®? ⚒ Are You a Pro? A bus driver in Asia used WD-40m® to remove a python, which had coiled itself around the undercarriage of his bus. Duct Tape & WD-40®: You often hear it said, "You only need two things in life: Duct Tape and WD-40. If it moves and shouldn't, use Duct Tape, if it doesn't move and should, use WD-40." Surely there is a reason for that. Crayola® Stain Removal Tips recommends using WD-40® Multi-Use Product to remove (regular) crayon marks from a variety of surfaces. The official 2,000+ uses for WD-40® grew for the first time, thanks to the help of WD-40® Fan Club members. 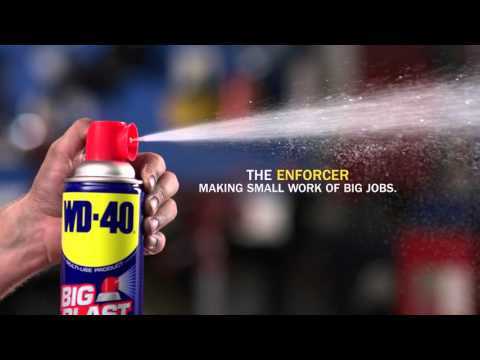 WD-40 Company introduced WD-40® Trigger Pro® – a non-aerosol product with the same WD-40 formula – to better meet the needs of its industrial consumers. The WD-40® Specialist®/SEMA Cares Camaro sold for $75,000 at the Barrett-Jackson Classic Car Show and Auction, with all proceeds to Childhelp® and The Victory Junction Gang® Camp children’s charities. WD-40 Company introduced WD-40® Specialist® – a new line of best-in-class specialty products under the WD-40 brand geared toward trade professionals. The WD-40®/SEMA Cares Mustang raised more than $200,000 to benefit Childhelp® and The Victory Junction Gang® Camp children’s charities at the 40th annual Barrett-Jackson Classic Car Show and Auction. WD-40 Company designed four cans to honor those who serve or have served in uniform. Total of $300,000 was donated to Armed Services YMCA, Veterans Medical Research and Wounded Warrior Project. Legendary hot rod designer and TV star, Chip Foose, collaborated with WD-40 Company, designing limited edition 8-and 12-ounce WD-40® Smart Straw® cans featuring his distinctive sketches. The Chip Foose WD-40®/SEMA Cares Challenger sold for $115,000 at the Barrett-Jackson Classic Car Show and Auction with all proceeds to Childhelp® and The Victory Junction Gang® Camp children’s charities. For the second year in a row, legendary hot rod designer, Chip Foose, has partnered with WD-40 Company to design limited edition, collectible Smart Straw® cans, featuring his distinctive vehicle sketches. The WD-40®/SEMA Cares Foose 1953 Ford F100 sold for $170,000 at Barrett-Jackson Classic Car Show and Auction with proceeds to Childhelp® and The Victory Junction Gang® Camp children’s charities. WD-40 Company celebrates their 60th anniversary with a commemorative Made in USA can. The Chip Foose WD-40®/SEMA Cares Foose Ford F350 raised $200,000 at the Barrett-Jackson Auction. Proceeds to Childhelp® and The Victory Junction Gang® Camp and the SEMA Memorial Scholarship Fund. WD-40 Company introduced a revolutionary way to reach the unreachable with WD-40 EZ-REACH™, which features an attached 8" flexible straw that bends and keeps its shape. Gravity met its match with WD-40® Specialist® Spray & Stay Gel Lubricant — a no–drip formula that stays where it’s sprayed. Four new, extreme-performance greases engineered for simplify the way you lubricate. Powerful. Safer. Easier to use, introducing our new non-aerosol Industrial-Strength Cleaner & Degreasers. A fledgling company called Rocket Chemical Company and its staff of three set out to create a line of rust-prevention solvents and degreasers for use in the aerospace industry. The company nearly doubled in size, growing to seven people, who sold an average of 45 cases per day from the trunk of their cars to hardware and sporting goods stores in the San Diego area. The first full truckload order for WD-40® was filled when employees came in on a Saturday to produce additional concentrate to meet the disaster needs of the victims of Hurricane Carla. In the late 1960's goodwill kits containing WD-40® were sent to soliders in Vietnam to prevent moisture damage on firearms and help keep them in good working condition. The company was renamed after its only product, becoming WD-40 Company, Inc. The WD-40 Company, Inc., went public and was listed Over-The-Counter. The stock price increased by 61% on the first day of listing. WD-40® was found to be in 4 out of 5 American households (it seems everyone has a can or two) and used by 81 percent of professionals at work. Sales had grown to more than one million cans each week. The new WD-40® Big Blast® can was introduced, featuring a wide-area spray nozzle that delivers WD-40 quickly and efficiently over large areas. WD-40® Multi-Use Product is the gold standard in utility. 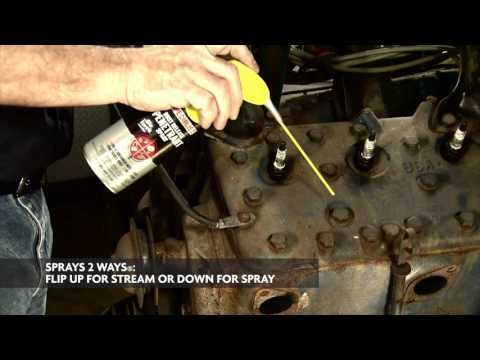 WD-40® Brand is a multi-purpose penetrating oil that protects metal from rust and corrosion, loosens rusted and stuck parts, displaces moisture, lubricates hinges and doors, and even removes grease, grime, and more from most surfaces. 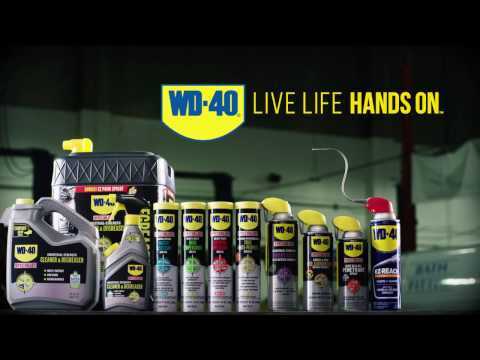 For a powerfully versatile penetrating oil with more than 2,000 uses, count on the blue and yellow WD-40® Brand can to help you live life hands on. Each WD-40® Specialist® product is specially formulated to help you in any sticky (greasy, or even rusty) situation. Our line of best-in-class specialty maintenance products equips pros of all kinds with the performance they need to live life hands on and get their specific jobs done right. Developed for the whole bicycle and with the dedicated cyclist in mind, WD-40® BIKE® products have been tested and perfected with bike retailers and mechanics to provide those who live life hands on with superior cleaning, lubrication, and protection. With protection and performance in mind, WD-40® SPECIALIST® MOTORCYCLE is designed to keep a motorcycle in optimal condition, allowing riders to safely do what they love: Ride!